As Africa urbanises and the focus of poverty shifts to urban centres, there is an imperative to address poverty in African cities. This is particularly the case in smaller cities, which are often the most rapidly urbanising, but the least able to cope with this growth. This book, a research output from the Consuming Urban Poverty project and edited by Jane Battersby and Vanessa Watson, argues that an examination of the food system and food security provides a valuable lens to interrogate urban poverty. 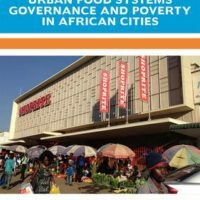 Chapters examine the linkages between poverty, urban food systems and local governance with a focus on case studies from three smaller or secondary cities in Africa: Kisumu (Kenya), Kitwe (Zambia) and Epworth (Zimbabwe). The e-book is available as an open access publication and can be downloaded free of charge here.